In this example we will configure a SIP trunk between the Avaya IP Office and Flowroute using registration on LAN1 behind a firewall/NAT. Alternative configurations would include a static public IP or static IP behind a NAT/Firewall which will not be covered in this document. NOTE: Flowroute claims T.38 version 0 support as of May 2009 however I have not been able to successfully negotiate any T.38 at this point, using version 0 at 9600bps and IP Office EI version 5.0 due to a requirement by Flowroute of information in the INVITE that the IP Office does not currently support. Thus far Flowroute’s technical support has been responsive and helpful. The call quality has been fantastic, far beyond what I have come to expect from other ITSP (over the Internet SIP providers). 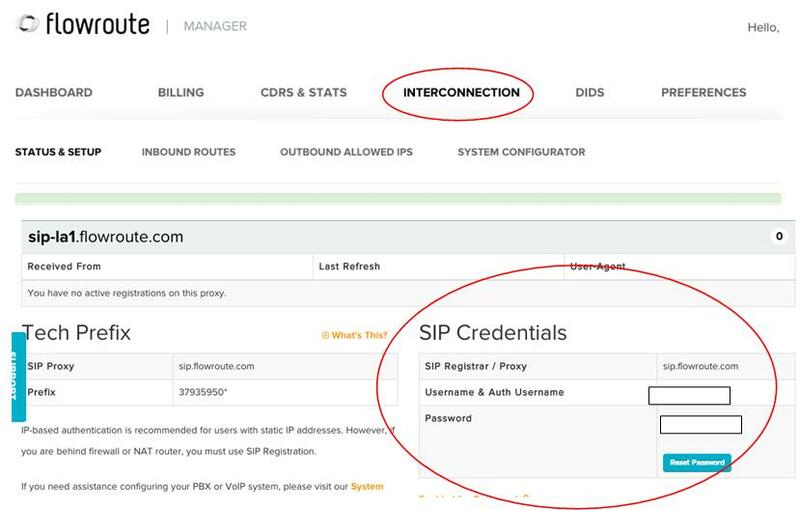 You can find the SIP Proxy name by clicking on Interconnection on the Flowroute Manager web site. On older releases of IP Office (r5 and earlier) it was not possible to use the domain name of the ITSP, but with R6, we could. The IP Office will need a number of ports opened on your firewall in order to properly communicate with the Flowroute SIP server. You will need to insure that the following ports are open for both inbound and outbound traffice, without restriction. 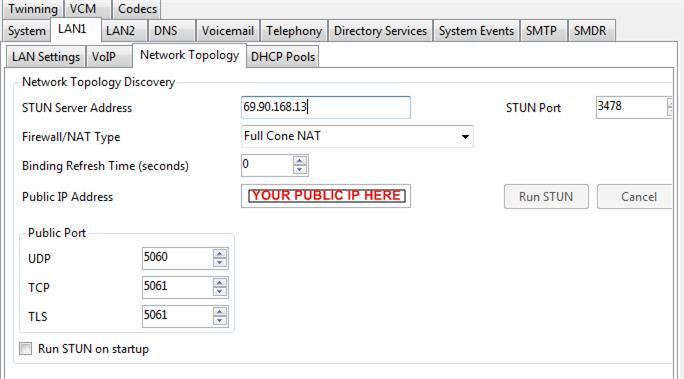 Once you have properly configured your firewall/NAT and your IP Office has properly recognized your public IP address via STUN and sees all necessary ports open you can proceed with configuring your peer/trunk with Flowroute. We will skip most of the basic signup options for Flowroute however you will want to start by visiting http://www.flowroute.com and selecting the Sign Up Today option create an account once done they will give you a $0.25 credit which will allow you to test their service for outbound calls. Purchasing a DID or placing inbound calls will require a minimum purchase of $35 and at least a single DID. While Flowroute does support routing to a public IP their default is registration which is what we will cover in this document. Go back to the Flowroute Manager web site and once again click on the Inter-connecton tab. Set the options to match the picture to the right making sure to select “Registration” as your “Peer Type” ignoring the “Peer Address” and enter any password you like in the “Password” filed. You must also make note of the full “Peer Name” at the top of this form as you will need to enter that later. Now we will create a SIP line in the IP Office. In Manager right click on Lines and select New>SIP Line. In the pane on the right enter the ITSP Domain Name OR the IP address, sip.flowroute.com in our example. 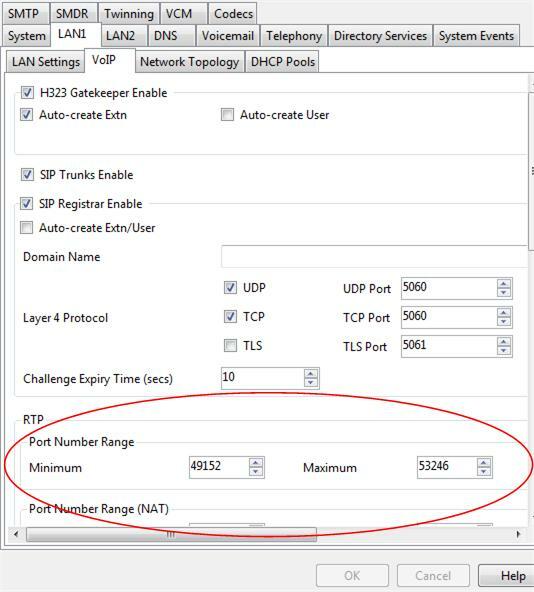 Select UDP as your Layer 4 Protocol and LAN1 as your Network Topology. Leave 5060 as your Send Port. 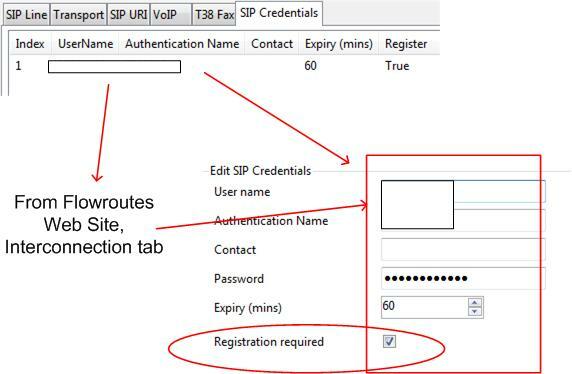 With IP Office 5.0 or higher, you may wildcard your URI on the SIP Line tab to allow for ambiguous validation of the URI on INVITE without the need to build a specific list of URI for validation. 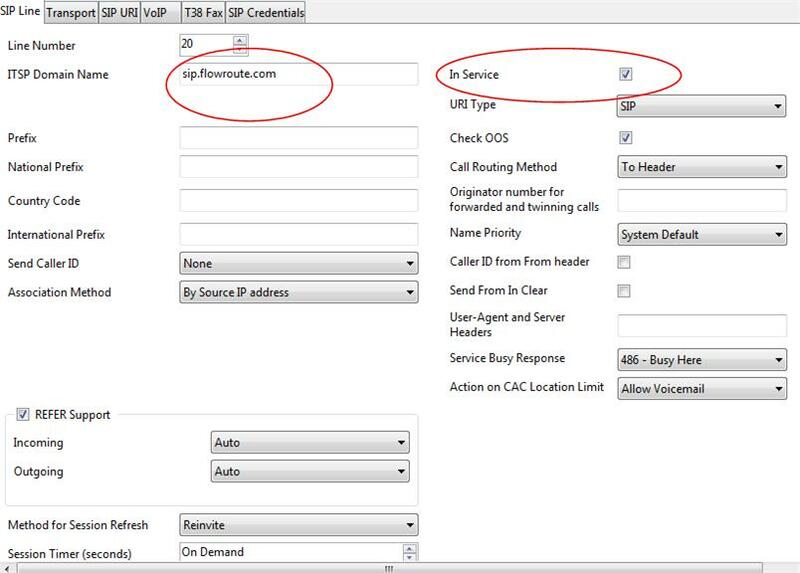 With IP Office R4 this was not possible and a specific URI list had to be created for inbound validation of the INVITE. Under your SIP Line click on the SIP URI tab and then click on the [Add] button. Typically you would enter your DID in the three drop down fields and repeat this step over and over for each DID that would not be associated with a specific user. Instead we will wildcard this entry by adding a * for each of the three drop down fields. 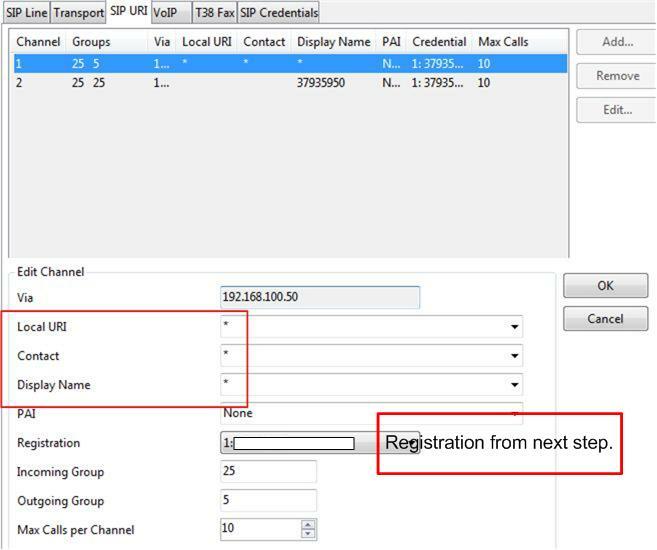 You will also want to set your Outgoing Group to some number not associated with any ARS table so that your outbound caller ID can be controlled by the “Use User Data” URI entry created in the next step. 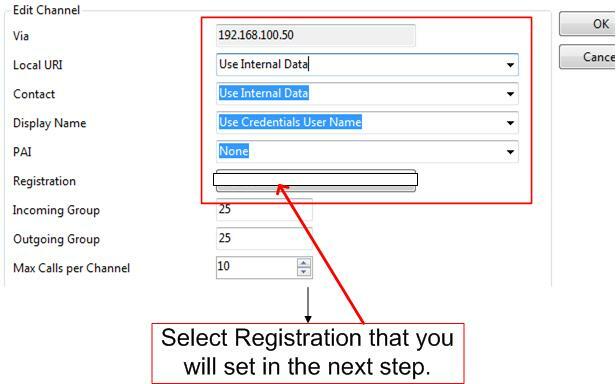 Now repeat the step above but this time we will select “Use User Data” for each of the three drop down fields. You will also want to assign an appropriate incoming and outgoing group ID for this line which will be referenced in your associated ARS tables. On the VoIP tab, set the preferred codec you wish to use. And check Re-Invite Supported. In the SIP credentials tab click ADD, and enter in the credentials that you got from the Flowroute.com web site. Also check the box for Registration Required. Next we must add our URI information for your individual users. For each actual user you will also want to set a URI. Either a unique DID for that user or a main telephone number that may be the same for multiple users. 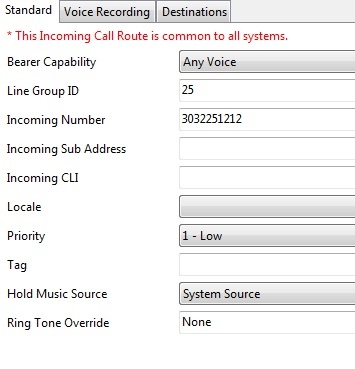 This will be used to display the outbound caller ID when that user places a telephone call.